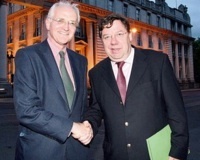 The wheels finally started coming off Brian Cowen’s premiership this week when he was forced to announce a date for the general election following a devastating bust-up with his coalition partners. Cowen is facing renewed calls from his own party to quit after the Green Party humiliated him by blocking new ministerial appointments and forcing him to bring forward the general election. An extraordinary lapse of judgement by Cowen saw a series of Ministerial resignations receive the acceptance of the President before his coalition partners were even informed. In Cowen’s mind, the resignations would clear the way for a grand plan to promote worthy backbenchers to Ministerial office ahead of the election. But in the end, the Greens humiliated him by blocking new ministerial appointments, leaving him with a rump cabinet of double-jobbing Ministers and forcing him to bring forward the general election. Already unnerved by the resignations, events on Thursday -- particularly the u-turn by Cowen and the unexpected naming of an election date -- caused an extraordinary outburst of confusion and fear among the Fianna Fail parliamentary party. Backbenchers roamed around the Dublin parliament in a state of near panic, to the evident delight of the assembly national and international media. That panic has not yet abated, despite attempts by Cowen tonight to proclaim the matter ‘yesterday’s controversy’. Serious questions remain as to how the Dublin government can manage any degree of functionality with deep divisions at its core and in the absence of six key Ministers. There are also renewed calls for the Taoiseach to quit by Tuesday’s challenger Micheal Martin and other senior figures, including a near-hysterical Conor Lenihan, the brother of the Minister for Finance Brian Lenihan and the serving Minister of State with special responsibility for Science and Technology. In addition, the coalition government (or what remain of it) faces a vote of no confidence in the Dail on Tuesday, and some backbenchers are said to be considering the option of putting clear blue water between themselves and Cowen’s hated regime before facing the voters. There was serious disagreement between Cowen and Green Party leader John Gormley about the circumstances in which the Greens vetoed plans for the appointment of six new ministers and precipitated the calling of the election. Gormley said the first he knew that a number of ministers had resigned in order to pave the way for the reshuffle plan was through the media as he had breakfast with his wife on Thursday morning. “It seemed to be a fait accompli,” he said. Anger by the Opposition that a ‘stroke’ by Cowen to use Ministerial appointments for electoral gain heaped pressure on the Green Party to finally make good on its long-threatened break with Fianna Fail. However, Cowen’s misjudgement appeared extraordinary. One senior TD who has been consistently loyal to Mr Cowen described the Taoiseach’s behaviour on Wednesday night and yesterday as “unfathomable” and expressed the hope that he would now stand down from the leadership of the party. Despite strong rumours that the votes of backbenchers in Tuesday’s showdown had been purchased with the prospect of a rapid promotion, several TDs rushed to tell journalists on Thursday they would not have accepted a ministerial promotion had it been offered. The party’s disarray has been compared to the final months of the deeply corrupt Haughey administration, now recalled by the acronym ‘GUBU’ of adjectives which were used by Charles Haughey himself to describe those events -- grotesque, unbelievable, bizarre, and unprecedented.